I think sometime during everyone’s lives, there comes a time when we are asked to cook a turkey. The first time I heard those dreaded words, I have to admit, I freaked a bit. But then I read up on what to do and for several years I was in charge of cooking the turkey breasts in our smoker. There are several ways out there to do this process and here are a few you may want to try. The first cooking idea is the traditional “in the oven” way to cook a turkey. The Yummy Life gives you a very detailed step-by-step way to do this in the oven. I’ve had an instant pot now for about a year now and haven’t cooked a turkey in it yet. Awe Filled Homemaker will teach you how to do that process with ease using a turkey breast. As I stated above I smoke my turkey breasts, but here is a very detailed version of how to BBQ your next turkey. Amazing Ribs not only shows you how to BBQ a turkey but also gives you several other ideas. 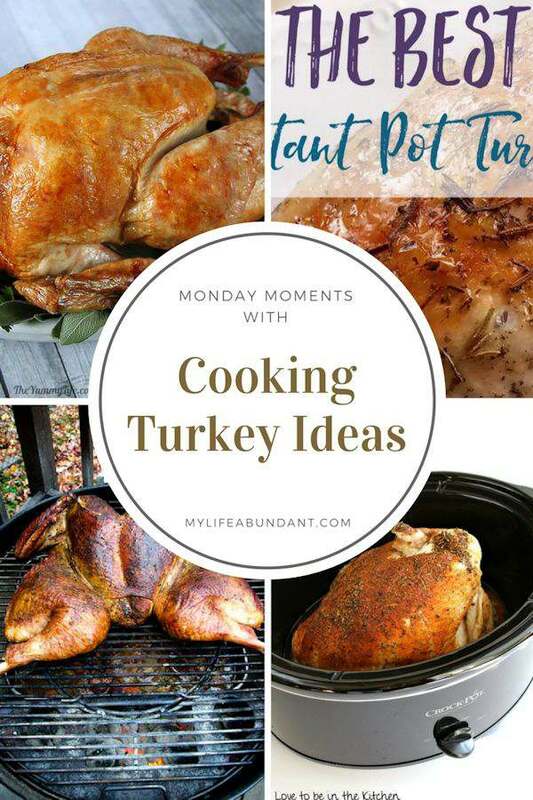 Love to Be in the Kitchen will show you how to cook the turkey in the slow cooker. I have to admit, I have had slow cooker turkey and it is so juicy and tender. Give this way a try also. I’ve been wanting to find out more about instant pots so I’m going to have to check that out. I had no idea you could cook a turkey in them.